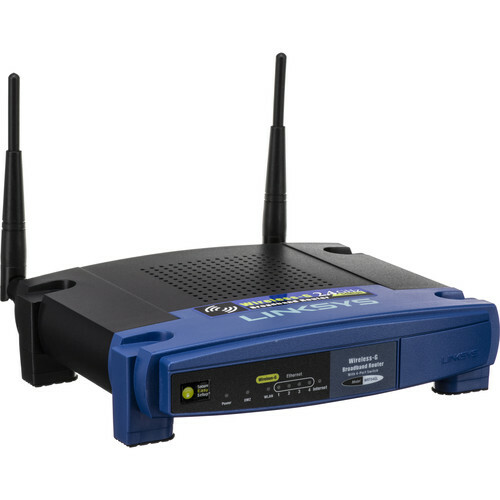 The WRT54GL Wireless-G Broadband Router with Linux from Linksys combines the functions of a Cable/DSL router and a wireless access point into one compact device. The router allows you to share your Internet connection between several computers that can connect via a standard 802.11b/g wireless connection or via any of 4 wired RJ-45 Ethernet ports. The router also features a firewall to protect you from malicious software that can attack your computer from the Internet, as well as wireless security to insure that your data remains private. The router can achieve speeds of 54Mbps via a standard 802.11g wireless connection and it is also fully backward compatible with devices that use the older 11Mbps 802.11b standard. These features make the wireless router a great way to add wireless access to your home network. In addition to providing wireless capabilities, the router has 4 standard 10/100 Mbps RJ-45 Ethernet ports to allow you to connect computers and devices that do not have a wireless card installed. This gives you the ability to simply plug in your desktop computer to the router while accessing your network wirelessly via your laptop. The 802.11g protocol allows for data rates of up to 54 Mbps when used with other 802.11g devices. The router is also fully backwards compatible with the older 11 Mbps 802.11b protocol and up to four devices can be connected via wired RJ-45 connections at 100 Mbps. The router features a powerful firewall to help protect your computer against malicious attacks that often target computers connected to the Internet. Additionally the router features network security to protect your data as it is transmitted wirelessly, ensuring that outsiders can't access your private data. The router uses Linux-based firmware to handle all of your network traffic. Linux is an open source operating system renowned for its stability and security. Hobbyists will appreciate the flexibility that a Linux-based router gives them. Box Dimensions (LxWxH) 10.787 x 9.685 x 2.598"
WRT54GL Wireless-G Broadband Router with Linux is rated 4.6 out of 5 by 166. Rated 5 out of 5 by b17aprincess from It's a tank I bought mine USED 11 years ago. I still use it, have never had any problems with it other than recently one of the Ethernet ports have began having issues. But again, its well over 10 years old and still works amazing, I can play xbox online AND stream media on a smart tv at the same time with no issues. Very impressed my dinosaur has lasted this long and still performs as well as it does. Never had range issues, could share internet with people in my apartment complex no problem and worked great in a 2 story house with a basement, with router on top floor. I would very much consider buying another one if mine ever dies. Rated 4 out of 5 by Isnotjoanne from I am so glad I persevered to install I bought this replacement two years ago but couldn't get it to work wirelessly. Well, my previous router WRT54G was dropping signals and generally not working well (8 years old) so I thought I had better give the "new" one a try again. IT WORKED! and I found out what I had been missing - didn't really realize my ROUTER needed replacing - it wasn't my service that was bad. The support pages at Linksys.com are great - you just have to keep reading and clicking to find the right information. Rated 5 out of 5 by Magician from Only needed the PS Bought this to replace the same model which was 8 years old. Turned out that all I needed was the power supply. Still happy. A PS would cost nearly as much as the whole package. If it fails, in another 8 years, I'll have a spare to troubleshoot. I've been very pleased with this unit, especially for the price. My speed seems to be limited only by the cable (copper) and cable modem in front of the router. P.S. : Keep a record of your settings. First time through may be time consuming, but it's not brain surgery. Rated 5 out of 5 by grommie from Totally Plug and Play and forget about it! Talking about the old one: My old one did not have antenna and I was always having to unplug it and reset it with my service providers modem. It was a major pain! This New One: I like this model a lot. I can log in and change passwords with ease, i can change the name of my connection easily. My wireless connection never cuts out. I don't know how long I have had it, couple a months maybe, and I have not had to unplug it, count to ten, stand on my head or hold my mouth just right! It has worked ever since I plugged it in. Rated 5 out of 5 by x_plicit from Solid Hardware and Stable Firmware Replaced an older Netgear 614 router with this one. I did a lot of research before buying and was put off by the vastly contradictory reviews of every other router I looked at. I considered going with a newer wireless N model, but this one this seemed to be the most reliable of all of the routers I looked at. I'm very happy with this one. I had it unpacked and installed on a Windows 7 machine in under five minutes. In very little time I had my network of two desktops, and two laptops up and running. I read a review somewhere that said something like: a million nerds can't be wrong. I think that sums up this router well. It has a great reputation and gets the job done. Unfortunately we do not have access to our inventory to be able to inspect the router for its revision. What is the significance of this item being Linux based. Does this mean it has the dd-wrt firmware? DO I STILL NEED A MODEM WITH THIS ? Yes, I use the modem from my cable company. My daughter uses her Mac with it and my wife's iPad seems to sync up to it nicely as well. All of our other android and PC devices as well as our HP wireless printers and all game consoles connect as well. I would verify with B&amp;H tech, but I think you are good to go with Apple products connecting to this router.